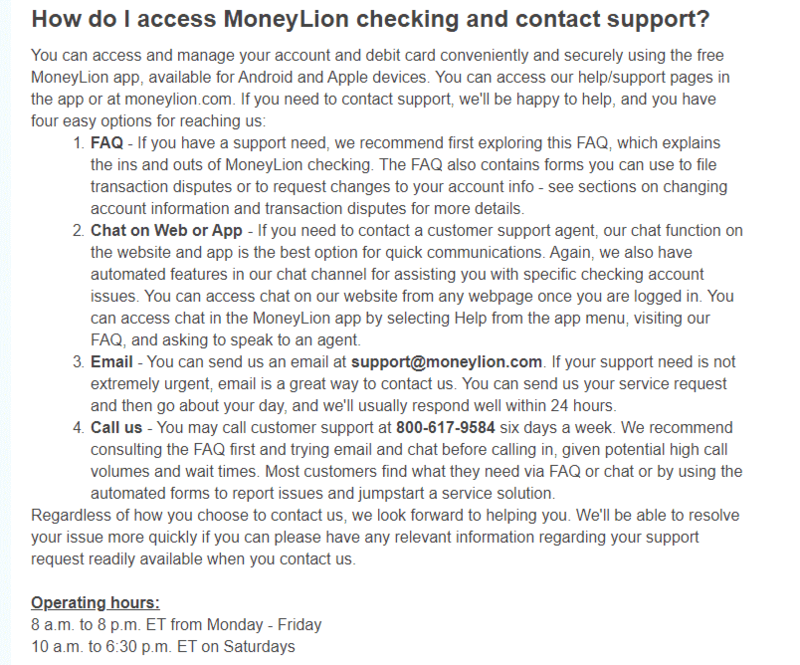 Top 12 Questions to MoneyLion Customer Service: Why Can’t I Withdraw Funds from my Account? MoneyLion is an online financial service company that provides customers with access to personal loans and tools that help them save money and track spending. Some customers have expressed concerns in their Moneylion reviews on PissedConsumer.com about certain aspects of the company’s business. We have compiled the most popular MoneyLion customer questions and answered them below. How do I contact MoneyLion customer support? How do I cancel my account or debit card? How do I order/replace a debit card? Why can’t I withdraw funds from my MoneyLion.com account? How long does it take for money to reach my checking account? What are my transfer limits? I added a new account. Why is MoneyLion Inc. taking funds out of my old account? How do I update/change personal information? How do I apply for a MoneyLion loan? I haven't received my MoneyLion card? What do I do? 1. How do I contact MoneyLion customer support? Many consumers who visit PissedConsumer write in their Moneylion reviews about difficulties contacting the customer support. Members can contact MoneyLion customer service through contact MoneyLion customer service representatives through the support chat feature in the MoneyLion app or through MoneyLion.com first. 2. How do I cancel my MoneyLion.Com account or debit card? This is one of consumers’ top questions. 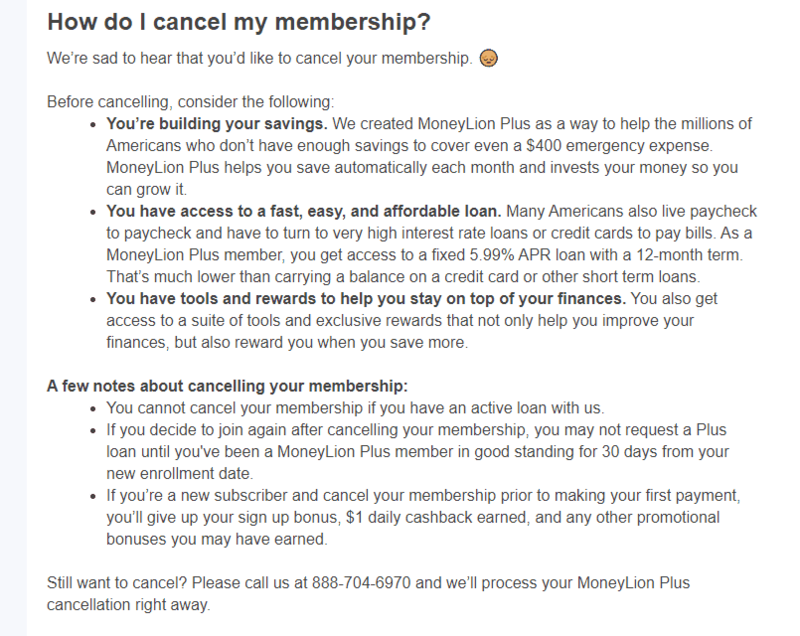 MoneyLion answers this matter in the support section of their website, explaining that customers can cancel their accounts by calling 888-704-6970. However, the company also explains that customers with active loans cannot cancel their accounts until the loan is paid off. 3. How do I order/replace a MoneyLion Inc debit card? Many customers who sign up for MoneyLion’s core service automatically receive debit cards in the mail, according to MoneyLion.com/core. 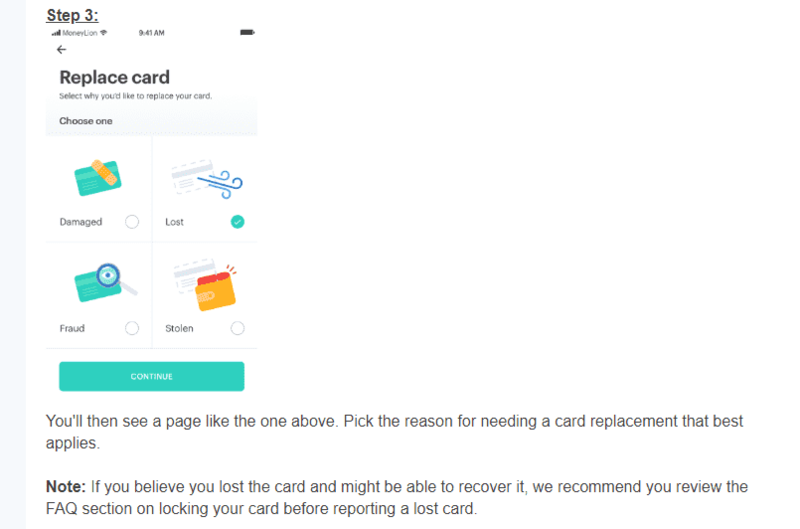 To replace a lost or stolen card, MoneyLion's customer support section instructs customers to use the MoneyLion app and click on the “Finances” tab. 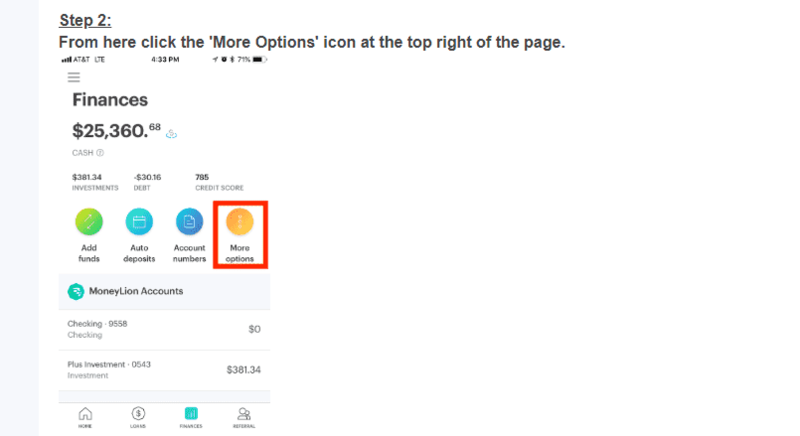 From there, members should click “More Options” at the top right of the page. Then members should select "Replace Card," choosing the reason why they need a new card. For example, they should specify of the card was lost, damaged, stolen, or if fraud was involved. The final step in replacing a card is verifying the address on file is correct. 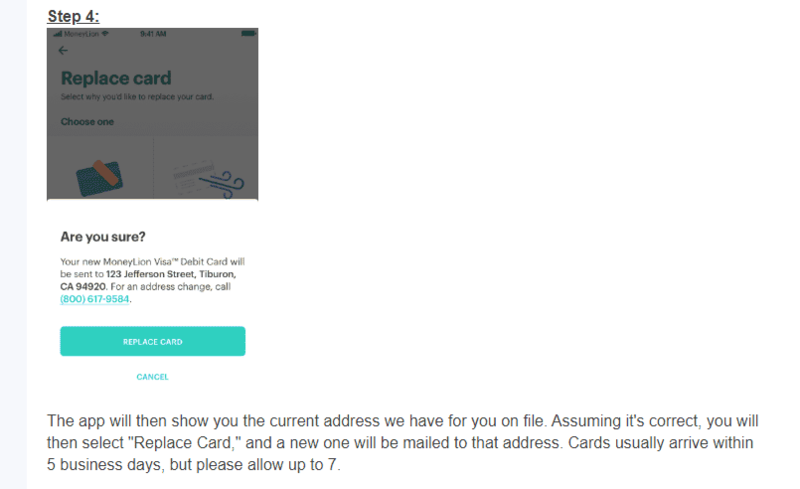 Once members confirm their address, they can click "Replace Card" and a new card will be sent to them. 4. How do I activate my MoneyLion debit card? 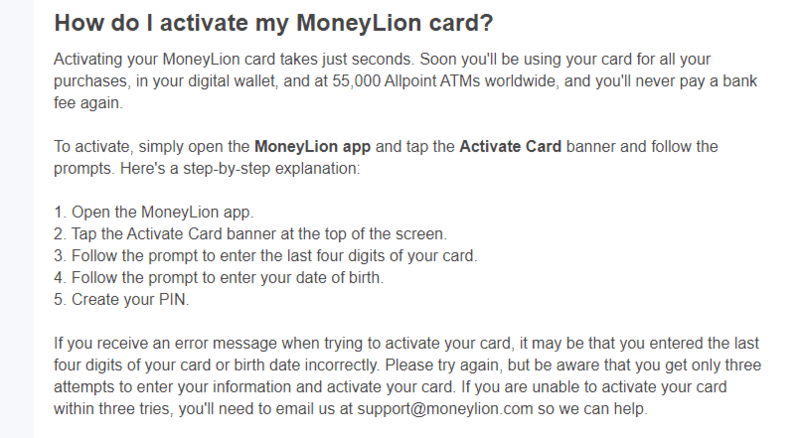 According to the website's support section, MoneyLion debit card activation occurs through the phone app. After logging in, customers select “Activate Card” banner located at the top of the screen. After selecting "Activate Card," members will be asked to enter the last four digits of their MoneyLion card. After entering the numbers, they will be asked to enter the date of their birth. The last stage of activating the card will be creating a PIN. Cards should be activated at this point. If members receive any error messages, they should re-enter the last four digits of their MoneyLion card or their birthdate. 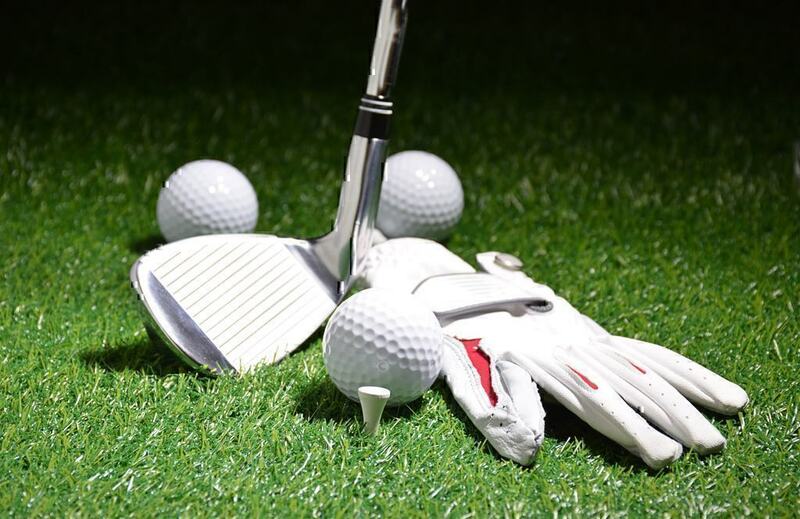 Members should double-check numbers carefully, as they are only allowed three attempts to activate their cards. If cards fail to activate after three attempts, customers will need to contact MoneyLion's customer service. 5. Why can’t I withdraw funds from my www.moneylion.com account? The support section of MoneyLion’s website explains that customers may not be able to withdraw funds if they have an outstanding MoneyLion Plus loan. Members must also have no less than $150 in their accounts to make any withdrawals. In addition, customers cannot withdraw from their accounts for the first 30 days of signing up. 6. How long does it take for money to reach my MoneyLion.com checking account? According to MoneyLion.com, the type of transaction determines how long it will take money to pot to your account. Direct deposit funds should be available on the pay date. External debit card transfers are instant. External bank transfers generally arrive in your account the next business day after the transfer was initiated. 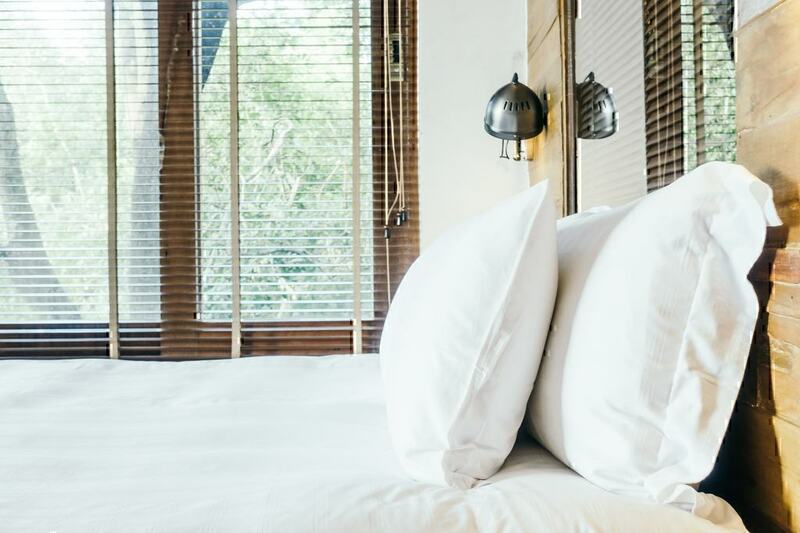 However, certain facts may prolong the transfer, such as the time of day the deposit is made. If the transfer occurred before 4 p.m. EST, funds will arrive the next business day. If the transfer took place after 4 p.m. EST, funds will arrive in two business days. Policies of other financial institutions may also affect when transfer times. Internal transfers from MoneyLion investment accounts can take up to 5 business days. 7. What are my transfer limits with MoneyLion Inc? ATM withdrawals cannot exceed $510 a day. Debit card purchases cannot exceed more than $3,000 a day. Transfers cannot exceed $5,000 a day and $50,000 a month. 8. I added a new account. Why is MoneyLion.Com taking funds out of my old account? 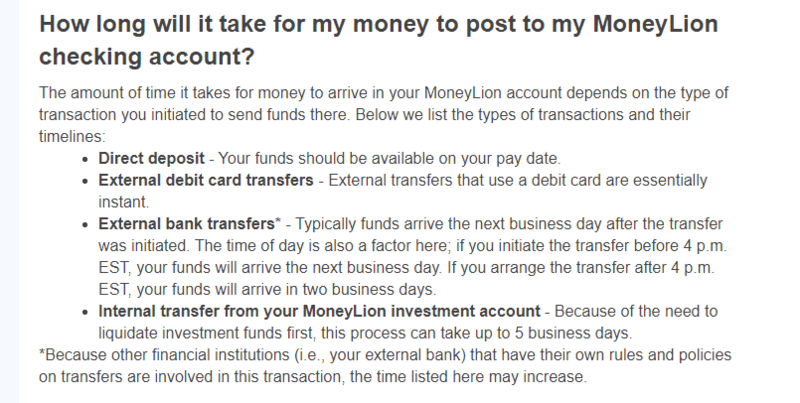 MoneyLion’s FAQ page explains that while customers can add bank accounts to their MoneyLion account, the company will continue to withdraw funds from the original account that was approved for MoneyLion or MoneyLion Plus membership. 9. How do I update/change personal information on www.moneylion.com? According to MoneyLion’s support section, customers can change or update their personal information by clicking the “Contact Us” button on their website. 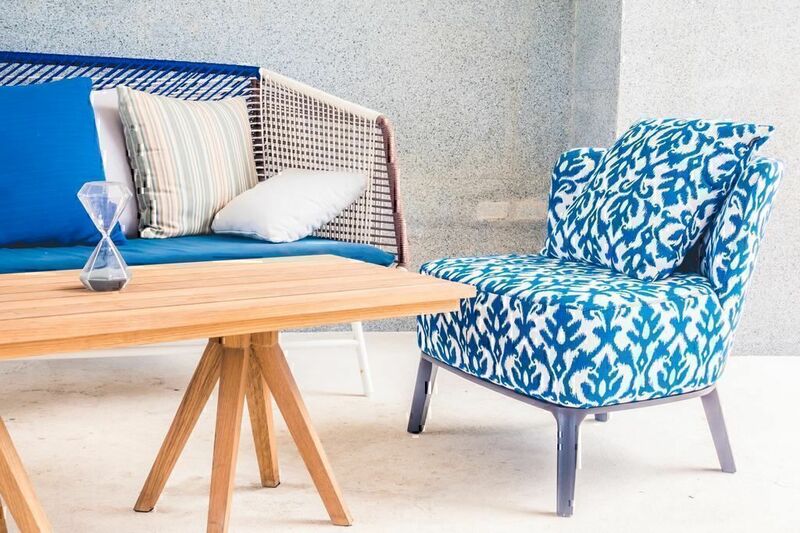 From there, customers will be prompted to provide their old and new address as well as mandatory documentation that verifies their new address, such as a valid government issued ID, utility bill or bank statement with the new address. 10. How do I apply for a MoneyLion loan? 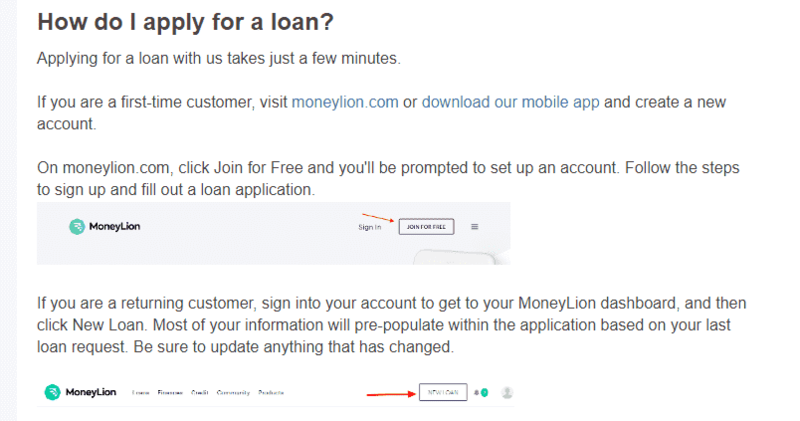 Members can apply for a MoneyLion loan when they first open up an account or by clicking the "New Loan" button on their MoneyLion dashboard, according to the MoneyLion’s FAQ section. 11. How do I verify my bank account? 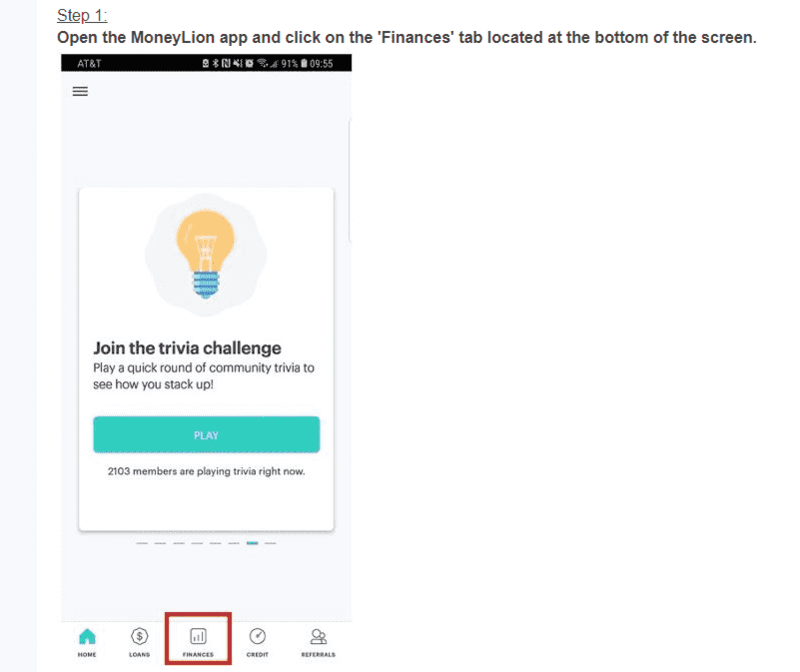 MoneyLion’s frequently asked questions section suggests checking login credentials with the bank associated with the account (username and password), keeping in mind that usernames and passwords are case sensitive. In addition, a strong internet connection is necessary because weak internet connection may time out or fail to connect. 12. I haven't received my MoneyLion card? What do I do? This is another one of the top MoneyLion consumer questions. Unfortunately, the company does not specifically answer this question on its website, so customers might get assistance by either contacting customer support representatives through the MoneyLion’s customer service chat feature in the app, sending an email at complaints@moneylion.com if you have a complaint about MoneyLion services or writing at support@moneylion.com for any tech support issues or questions, or by calling MoneyLion's customer care number at 1-800-617-9584. Ask the company via Pissed Consumer Questions and Answers section. Post a review to share your experience with others, and get an insight on how to solve your problem. 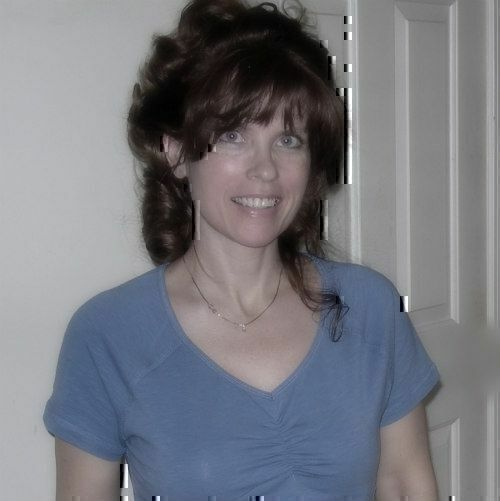 Kim is a fitness and online shopping expert with a background in journalism. She has been writing professionally for more than two decades. 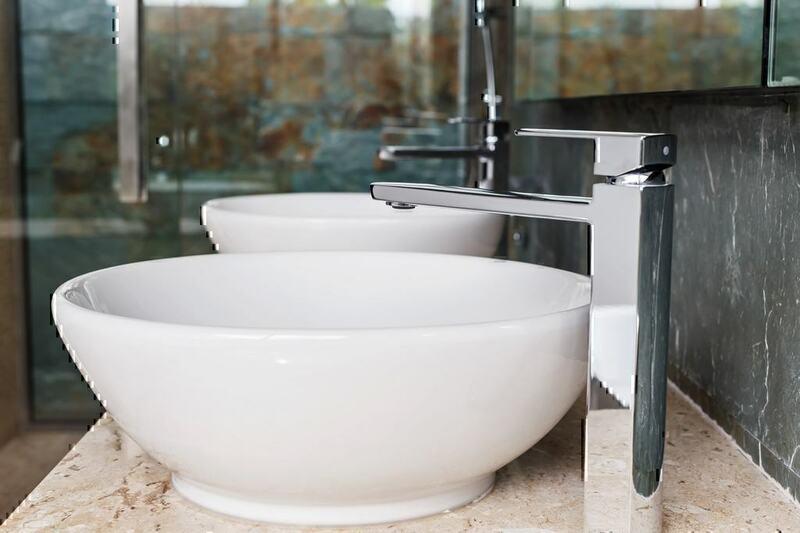 Kim has worked with digital media corporations and several non-profit businesses, including Habitat for Humanity and Serenity House.